The loss of the Star Wars license to Marvel might be the best thing to happen to Dark Horse in a creative sense. Without the crutch of that massive franchise, they've had to reinvest in older properties and bring out some of their potential. That's why we got Grendel's return in Grendel vs. the Shadow and the return of the Xenomorphs and Yautja in the epic Aliens/AVP/Predator/Prometheus: Fire and Stone crossover. Yet another story cycle recently kicked off with Predator: Life and Death. In the meantime, one Predator appeared in Mortal Kombat X and another crossed over into Riverdale for Archie Meets the Predator. Like the Aliens comics, the Predator comics franchise got its start with Mark Verheiden. Also like those comics, the initial Predator books are fantastic. 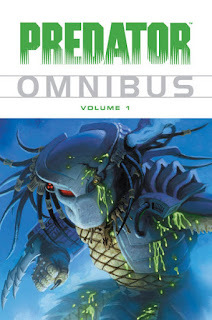 This review links to the first Predator Omnibus but I'll be concentrating this review on the first story, Concrete Jungle (a retroactive title in the same way that the first Aliens mini-series became Outbreak in collections). The others are pretty good, but they were written after a wide variety of new weapons were designed for Predator 2, and while I like the weapons, they take away from the purity of the hunting style seen in the superior first film. Verheiden had less technology to work with for Concrete Jungle but he used what the Yautja already had to great effect. Many elements from Concrete Jungle mark it as an early version of what would become Predator 2. The opening chapter in particular is basically Act I of the screenplay -- there's a gang war during a massive heat wave and a Predator takes advantage of the situation to go hunting. Additionally, the main character is a cop, but here it's not Danny Glover but cowboy cop extraordinaire Detective Schaefer. He gets no first name but his last name is familiar; that's because he's the brother of Dutch Schaefer, the lead character of Predator. What I find interesting is that he isn't drawn to look like Arnold Schwarzenegger. Instead, he looks a lot like Dolph Lundgren, the go-to Arnold replacement (he's in Kindergarten Cop 2 later this year [The trailer. I can't even. -- ed]). Verheiden's choice of character and character design is part of his plan to play off the action movie and comic book clichés of the time. The New York of the near future feels like Gotham City from The Dark Knight Returns if it had a heat stroke. In the same vein as the "eye box" from Aliens: Outbreak, we get some absurd yet strangely plausible predictions of popular culture, including dueling talk shows hosted by Ted Bundy and Charles Manson. Schaefer's superior is the classic obstructive police chief, castigating Schaefer for random failures even when terrifying aliens are decloaking all around them. His partner, Rasche, has a family and is clearly "getting too old for this s--t", but he does avoid some of the older grumpy partner clichés by being smart about the unfolding situation and trusting Schaefer as strange events unfold. Schaefer is forcefully recruited and aided by General Phillips, Dutch's gruff commanding officer in the first film. As per the original film, Schaefer takes on the visiting Predator, killing it by the halfway point. This is where the really original part begins; Verheiden uses their cloaking ability to truly amp up the fear that the Predators can cause once the police seize the dead alien's helmet. In the space between Predator and Concrete Jungle, interactions between the Predators and the world's governments have led to a détente, allowing the aliens to hunt so that they don't wage war upon humanity. Schaefer has broken the pact and the war begins . . . except that no one can see the invaders and everyone thinks that Schaefer and Rasche are crazy. What's neat about this set-up is its resemblance John Carpenter's film They Live, in which aliens rule the world and keep humans pacified with subliminal messaging and invisible signs. Verheiden is clearly paying tribute to this with the Predator helmet in place of the signal-piercing sunglasses. Shortly after the publication of Concrete Jungle, Dark Horse would start publishing sequels of Carpenter's classic film The Thing, and I wish Verheiden could have done a They Live comic in that vein. Some of the same satirical, anti-corporate tone went into his revival of The American in the mid-90s with Lost in America. Speaking of The American, his partner on that project, Chris Warner, drew Concrete Jungle and the results are pretty fantastic. The big reveal of how the Yautja have invaded New York City is worthy of a film adaptation, and he has the right amount of pure grittiness without being unreadable. Unfortunately Warner was also the first to discover that it's very difficult to draw an unmasked Predator. The face design often ends up creating tiny but always bugged-out eyes and overly large mandibles, plus I always preferred the helmeted look anyway. Warner's cover to the first issue became one of the franchise's most memorable images and even got turned into an action figure by NECA.